A Yazidi mother and her 12-year-old son had an emotional reunion in Winnipeg early Thursday, three years after their family was separated when captured by ISIS in northern Iraq. She discovered last month that one of her missing sons was alive when she saw his photo on social media. There were tears, hugs, smiles and songs at the Winnipeg airport early Thursday morning as friends and family witnessed the reunion of a Yazidi refugee mother and her 12-year-old son. Nofa Zaghla wept as she met her son privately behind airport security before appearing before dozens of supporters and reporters in the arrivals area. 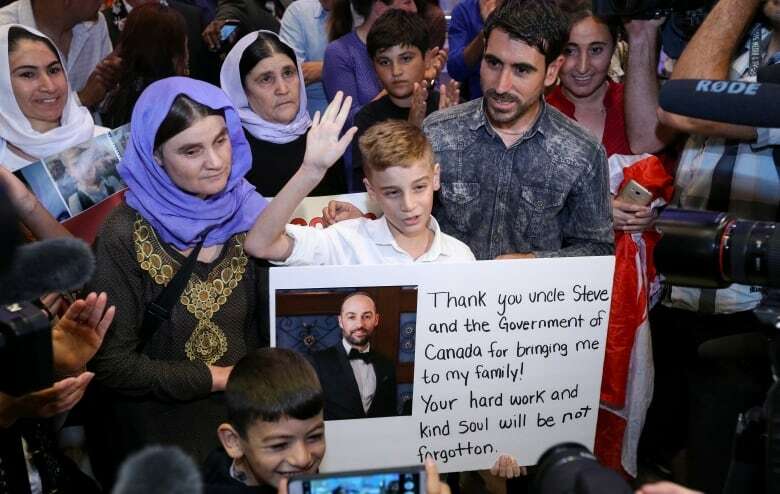 "Thank you, Canada, thank you Steve Maman," Emad Mishko Tamo said, referring to the president of the group The Liberation of Christian and Yazidi Children of Iraq, which orchestrated a campaign to expedite his reunion with his mother. "I'm happy, I'm very thankful for anyone that had any part in me reuniting with my mom," Emad added through a translator. "I am very happy and very thankful to God that he got here safely and soundly," his mother said, also speaking through a translator. It's been a month since Zaghla discovered her son was alive. She and her family were captured by ISIS in northern Iraq in 2014. An estimated 500,000 people were kidnapped, killed or became refugees in what the United Nations and others are describing as a genocide of Yazidis. The family members were separated, but Zaghla and her four younger children managed to escape and spent nearly one year in a refugee camp. Six months ago, they arrived in Winnipeg as government-sponsored refugees, part of the Trudeau government's commitment to resettle 1,200 Yazidi refugees and survivors of the Islamic State in Iraq and Syria to Canada by the end of the year. A ministerial spokesperson says more than half have already arrived. Zaghla had no idea what had happened to her husband and two older sons until last month, when photos of Emad began surfacing on Facebook. 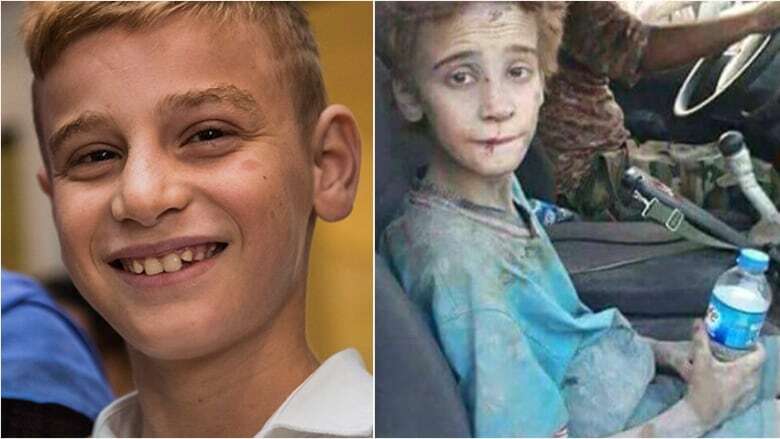 They were posted by Iraqi forces, who rescued him after a battle in Mosul. 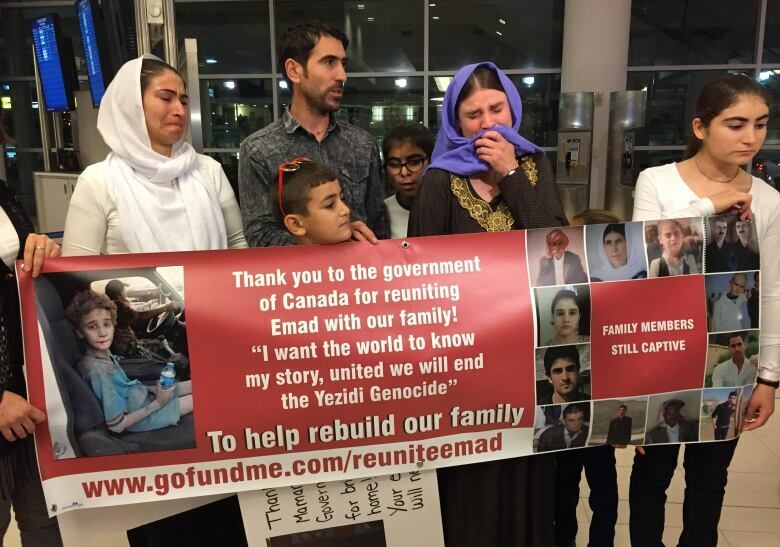 Groups such as the Yazidi Association of Manitoba and The Liberation of Christian and Yazidi Children of Iraq (CICY) began advocating on behalf of the family, sending emails, raising money, and urging the federal government to reunite the mother and son. Soon after, immigration officials said Emad's case was being expedited. "We can confirm that we are aware of the situation and are acting accordingly," a government spokesperson sent in an email to CBC News. "We are expediting the case, as we are with all Yazidi cases." Boris Ntambwe, the family's case worker at the Winnipeg resettlement agency, Accueil Francophone, says the federal Immigration Department treated the case as a priority. "Normally this kind of a case, we call a one-year window process, it takes about a year for the family to get reunited depending on the cases. But this particular case was processed within a month," Ntambwe said. Supporters said it was the right thing to do. ​"For myself, I can't describe how happy, emotions," said Khalil Hesso, president of the Yazidi Association of Manitoba. "It's a big day for us. We should celebrate all night. We're not going to sleep, I can say that." Emad's case is a testament to Canada's work on refugee resettlement, "offering a space, a safe space for families to be reunited," said Jean-Nicolas Beuze, the United Nations high commissioner for refugees representative in Canada. He just happened to be in Winnipeg for other meetings and came to the airport to join the welcome. "As the UN refugee agency, we're very grateful to Canada because it's very important that we keep the family unity, whether it be for this Yazidi family or many other families around the world," Beuze said. No one knows if Zaghla's husband and her other son are alive. Emad still has a tough road ahead of him. He's suffering from bullet wounds and psychological trauma. But for now, the focus is on the moment when a mother's dearest wish came true.